Electron Beam Welding in an unconventional Method to Join the two materials. In this two pieces of material are fused by a high-speed beam of electrons. The electron beam imposed on the materials will lose its kinetic energy and convert it into the heat energy. this heat energy is used for the fusion of metal Work-piece. The Vacuum medium is required to get a proper flow of electron beam and prevent dissipation of electron. There is no need to use any filler material. Electron beam welding enables the single pass welding of thick joints. There is less chance of impurities to enter into the vacuum medium so the welding would be more efficient. Hermetic seals of components are used to retain a vacuum medium for a successful welding operation. 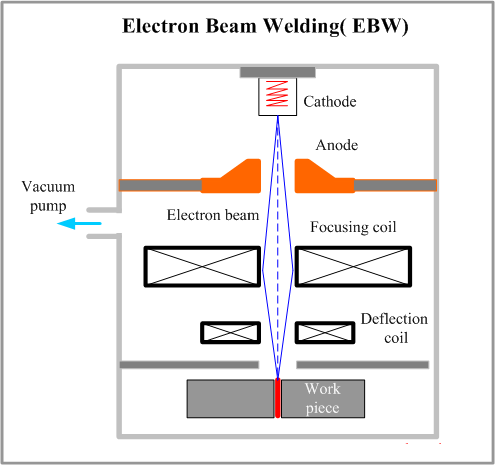 Electron beam welding offers the joining of dissimilar materials. The chances of welding defects to occur is less. Heat generated by electron fusion will affect the fewer area of the specimen. The size of specimen depends on the vacuum equipment. In the electron beam welding, rapid solidification is required that causes cracks.